Pick-up for this Sale is Thursday January 30th, 4pm to 8pm and Friday 10am to 2pm ONLY. Please note...the original listing stated a double vanity sink in description, and the original stock photo...in the subsequent photos, it showed a single, and we verified it was a single 60' vanity. Please bid accordingly. The Queen 10" memory foam Allure mattress is designed to support your body while you sleep. Layers of high density memory foam conform to your curves, giving you superior comfort and support every night. This soft and supportive mattress reduces tossing and turning and has minimal motion disturbance so you and your partner can slumber in peace. Get the rest you deserve on this Allure memory foam mattress. Overall Dimensions: L 80 in. x W 60 in. x H 10 in. Individual Tile12'' W x 12'' LOverall Thickness0.3750002''Square Feet per Carton10 square feetRecommended Grout Joint1/4 inchesOverall Product Weight5.78 lb. Product descriptionReach back in time to recreate a beloved interior design scheme. Full of charm, this graceful sofa offers a visually pleasing silhouette with a tuxedo style build and ornate back and inner side tufting. Gorgeous charcoal linen blend fabric is soft and inviting, and complements upscale color palettes. High shelter arms and fully reversible seat cushions maintain structural integrity and comfort. Tapered legs in brown finish solid wood finish the decorative effect of this stellar sofa. Whether you're transforming your dining ensemble or rounding out your seating space. The round top offers up a subtle slatted motif, while the base features an X design for geometric appeal. Pull a few coordinating side chairs and hang a sleek pendant overhead so you can serve up Sunday morning brunches or host elegant dinner parties in classic style. Or, really up the glamour with a vibrant damask rug and a metallic vase filled with blooming florals for a look that's sure to impress. Overall48'' L x 48'' W x 29.5'' HOverall Product Weight81.4 lb. Upgrade your living room with this modern style faux leather sectional sofa set with an extra storage ottoman to easily organize your goods. This luxurious sectional set will add refinement to your home. Arredondo Sofa's curves and hand rubbed antique leather look gives it an elegant charm of its own adding a touch of class to any room. Height of seat from floor: 18"
This Zachary Armchair complements any design theme with classic styling and substantial comfort. Overall Product Weight	76 lb. This cozy bustle-back frame features embellished cushion soft arms for extreme comfort. This all American classic design has an exaggerated arm and banded base. Body fabric is 100% Polyester chosen for it’s easy to clean properties. Body is 100% Polyester, cleaning code S. Coil spring cushion encased in high-density foam with blown fiber backs. Frame constructed of hardwoods and OSB for long-lasting durability, stapled and glued, recycled sinuous steel springs. Viceroy Loveseat features a classic and elegant frame with a timeless and flexible design that complements many different lifestyles. The classic roll arm is padded for extra comfort and features a top-stitching detail that is combined with refined welt detail. Semi-attached blown-fibre back cushions create luxurious comfort with a T-cushion detail extending the back pillow over the arm. This item brings sophisticated elegance to your home will suit any classic space. Attached seat cushions feature a high-resiliency, high-density foam core with a polyester wrap. Semi-attached back cushions feature a fiber filling, blown into channels to prevent shifting and provide pillow-soft comfort. Crafted of durable, high-grade Italian leather that is both soft and supple, this collection provides both comfort and class with its sophisticated styling and tufted old world charm. Server: 58"W x 18"D x 42"H - 187lbs. Are you looking for a pair that includes a chair and a matching ottoman? Want that set not only to be very beautiful but also very comfortable? 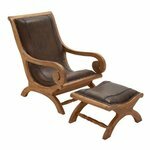 Well, you needn’t search further because this wood leather chair ottoman will be your perfect partner. Simply exquisitely designed, the chair that comes in this set is a very distinctive looking creation. Also, it is extremely comfortable. Also, the ottoman matches with the chair exactly. This pair will be perfect for a home that has traditional ites: indeed, the set has a nostalgic appeal. Also, this chair and ottoman have been made using quality materials; hence it will last in great condition for years to come. If you are renovating, it can be the perfect addition to your living room. So consider getting it today. You will like it like nothing. Overall36'' H x 30'' W x 24'' DOverall Product Weight87 lb. Pure color and stainless steel play well together in the Sprout Café Dining Table. This cafe table features a round top and matching stem with stainless steel legs - the color also peeks through the legs for a flirtatious touch. This table is perfect for smaller kitchens or dining rooms. Overall36'' L x 36'' W x 28.5'' HOverall Product Weight47 lb. The Springfield Collection by Liberty Furniture is made of Rubberwood Solids & White Oak Veneers in Honey & Cream Two Tone Finish. This group features Heavy Turned Legs With Splayed Feet and ladderback chairs. The Single Pedestal Table includes one 18 Inch extension Leaf. Lounge in luxurious comfort in your own backyard with the Serta Laguna outdoor sofa. Stretch out, sink into the soft six-inch cushions and cozy accent pillows and relax with a cold drink or your favorite book. Bring warmth and sophisticated comfort to your outdoor decor with bronze, hand-woven wicker to entertain in style or simply unwind in the sun. Premium, high-density polyethylene resin, a rust-resistant aluminum frame and quick-drying olefin cushions deliver weather-resistant durability your family can rely on for years of outdoor enjoyment. Relax knowing the cushions will retain their cozy comfort and style even if they’re left out in the rain. Overall28.35'' H x 71.26'' W x 33.86'' DSeat Height Without Cushion16.5''Seat Cushion Thickness6''Back Cushion Thickness6''Overall Product Weight84.04 lb. Has a crack in wood on one side of table. One of the feet will need to be repaired or replaced. Casual dining never looked so good! Give the kids a spot to enjoy their morning meals before school and gather round friends for happy hour with this five-piece counter height dining set. Each piece is constructed from wood, featuring a black finish for versatility. Its square table features two open shelves for keeping dinnerware and napkins on hand. Plus, each stool lends decorative appeal and comfort with an openwork back and leather-upholstered seat. Table Leg Height - Top to Bottom32''Overall Table Weight52 lb. Chair Seat Height – Floor to Seat24''Overall Chair Weight23 lb. Overall40.75'' H x 41.25'' W x 16.68'' DShelf12.5'' H x 38.75'' W x 15'' DCabinet Interior38'' H x 27'' W x 15.88'' DTV Size Accommodated47Weight Capacity300 lb.Overall Product Weight55 lb. Overall30.5'' H x 66'' W x 37'' DOverall Product Weight191 lb. Overall36'' H x 56'' W x 19'' DOverall Depth - Front to Back - Bottom drawer fully extended29''Overall Product Weight157 lb. Drawer pulls center to center: 3.88"
Adding a bold touch of glamour to your boudoir is this Collection. Finished in a brilliant white, the embossed alligator board is reflected in the inlay mirrors of the bed and case pieces. Turned feet provide a distinct departure from the linear design of the collection, adding a distinctly beautiful flair. Drawer pulls add to the allure of the collection with an inlay crystal and chrome look. Overall - Dresser42'' H x 66.5'' W x 17.75'' DOverall Product Weight - Dresser194.5 lb. Overall - Mirror38'' H x 50'' W x 1'' DOverall Product Weight - Mirror40.2 lb. Add contemporary cool to your master bath with this 72'' W double vanity set. Founded atop a solid and manufactured wood base, it features a stone countertop finished to look like white Carrara marble, and two white ceramic undermount sinks. Six faucet holes are drilled into the countertop, making it easy to install faucets of your choice. This vanity includes two back cutouts for effortless plumbing installation, and over eight storage areas to make corralling your toiletries a breeze. Appears it might be cracked, Please Attend Inspection. The elaborate designs are treated with a distinct modern touch in this collection. The marble topped tables feature a delicate gray hue that accents the silver, with gold undertone, finish of the wood base. With details such as shell and acanthus leaf scrolling and cabriole legs, the traditional look of the collection is solidified. Overall20'' H x 52'' L x 30'' WTable Top Thickness5''Overall Product Weight96.8 lb. Perfect corralling your beauty essentials in the master suite or spa-worthy accents in the guest bath, this elegant vanity effortlessly completes any space. Overall36'' H x 37'' W x 22'' DBase35.31'' WCabinet Interior35.2'' H x 21.6'' DDrawer Interior3.93'' H x 8.6'' W x 13.7'' DBasin5.7'' D x 9'' W x 16.7'' Overall Product Weight146 lb.Base Weight92.6 lb.Countertop Weight58.2 lb. Overall Product Weight	113 lb.